You don’t bring a knife to a gunfight. And you don’t bring a pop-up rental from the Air Force Base to a luxury RV campsite. But that’s what I did. Hey, the pop-up was cheap and it kept us dry. Besides, the real trailers were already rented. When we pulled in, the total length of my SUV and the trailer combined was shorter than the smallest RV in the lot. When we popped the canopy, our “neighbors” never said a word. They just stared. It was “The Beverly Hillbillies” meet Thurston Howell, III. Or, for the younger crowd, it was Snooki meets [insert the name of some really rich people here]. We were the only ones without a satellite dish. During the mandated “quiet hours” we had a hard time sleeping. It got very cold, but that’s not what kept us awake. It was the sound of twenty propane-fueled heaters kicking on all night that made it tough to nod off. It was like sleeping on the runway of a Naval Air Station during nighttime quals. Clearly we didn’t belong there, and they definitely had us beat in the luxury category. But they missed the feel of the cold night air against their faces, and the coziness of a thick, warm sleeping bag. They missed the smell of a juicy steak roasting over an open fire, and the sound of the mountain wind blowing through the pines. On reflection, I think I prefer camping the old-fashioned way. 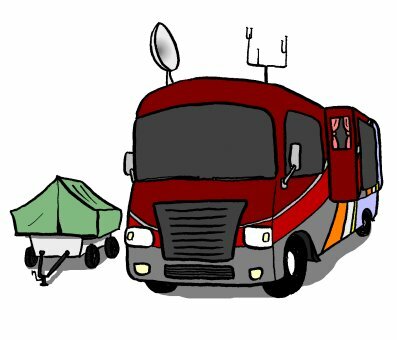 When I balance it all out – the plushness of a decked-out RV versus the raw, rustic experience of tent camping – I think I know what I want. I want to be Snooki. Camping in a mobile home is not camping. It’s not “roughing it”. It’s having a portable hotel room. If I want luxury, I’ll go all the way and get the hotel room. On the other hand, I did upgrade from my one-man backpacking tent to a far larger one that I can put my two-inch high cot inside…. I agree, and will go a step further to say pop-ups aren’t really camping either. My preference is hiking in with everything I need on my back. But the pop-ups are nice when families are involved. The cots you mention are really nice and make for a great night’s sleep. You all have it wrong. A true campout is when you check in to the Holiday Inn. Now that’s roughing it!